With polled axe heads it is easy to get carried away. It would be easy if they were marked used for this or used for that. But they aren't. For every tomahawk collector who does not know what else it could have been used for this opens the door wide for confirmation bias. Hammer polled tomahawks are hatchets often with a typical tomahawk axe blade and a solid poll on the other side which extends further than what is used in regular hammer poll hatchets used as tools & is usually decorated with simple to elaborate filing work. Some polls will extend 2.5-3" long. They began making them at least by 1702 for French Grenadiers as seen in an early etching, about 50 years before pipe tomahawks began. Also the polled tomahawk has a poll which angles slightly downward from the straight across axis. In other words, the poll is not exactly 90 degrees from the handle but is angled slightly downward toward it. Sometimes the blade is angled downward slightly too. Usually the poll begins ~1/4" or more below the highest point of the eye. Now there are also instances where regular everyday handyman hatchets were adapted for use as a tomahawk but these are few and far between. 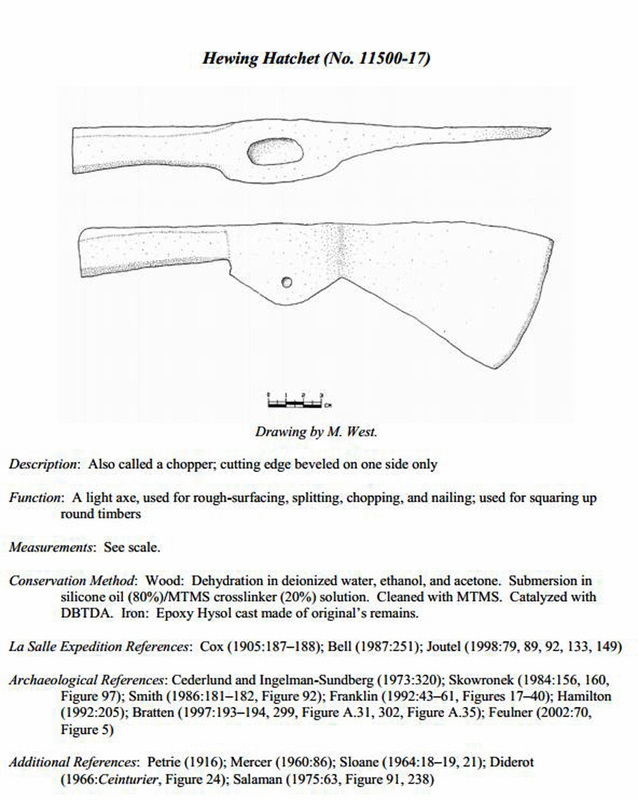 Lathing hatchets (used on early plaster walls & ceilings with wood lath strips) are often mistaken for polled tomahawks but lathing hatchets will not have the poll extended as far & are usually square in cross section whereas the polled tomahawk has a octangular or round cross section. Some have argued that only the lathing hatchets will have a notch in the blade for pulling nails & if it doesn't have that notch it is a tomahawk. But the fact is lathing hatchets were made with AND without the nail pulling notch in the blade so the notch criteria does not eliminate it as being a lathing hatchet. 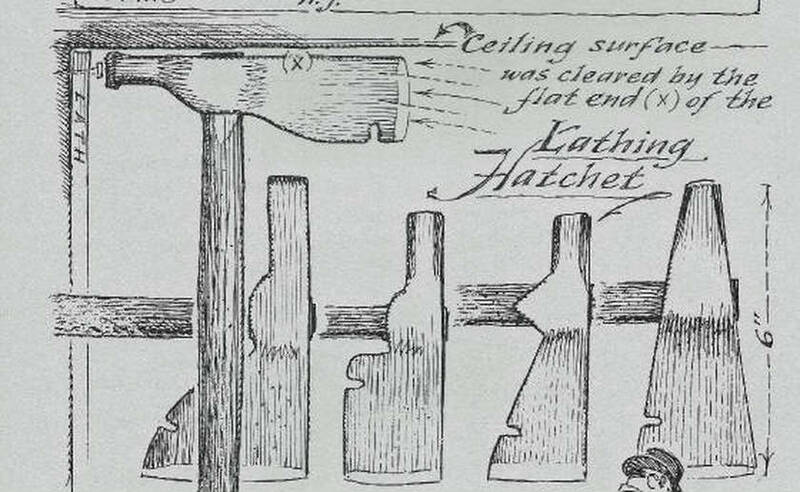 Lathing hatchets were made flat on top with the blade, eye and poll at the same highest level, so hammering could be done at the corner of the wall & ceiling to provide needed clearance. 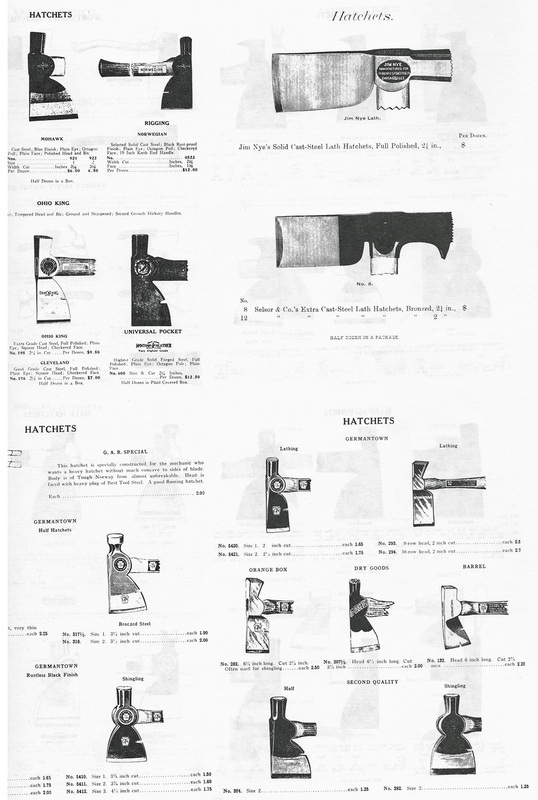 (See pg 17 Fakes, Mistakes & Reproductions; Peck Stow & Wilcox catalog 1923; Hibbard, Spencer, Bartlett & Co 1922 catalog). The other polled axes commonly found during colonial times can easily be confused & intermixed with polled tomahawks. 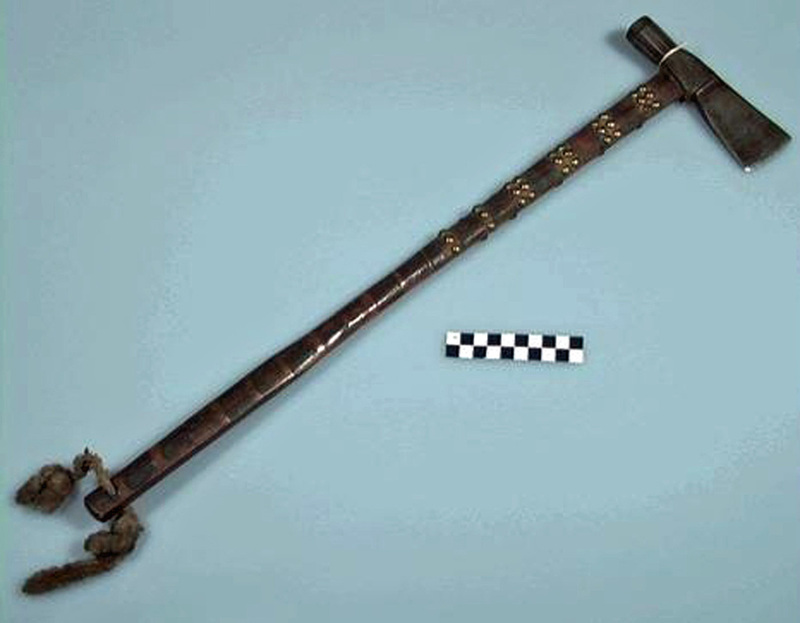 Just like polled tomahawks, polled axes were also carried on the belt. They may have been used as a weapon or not. Usually the polled axe will have somewhat extended polls also although they average a bit shorter. 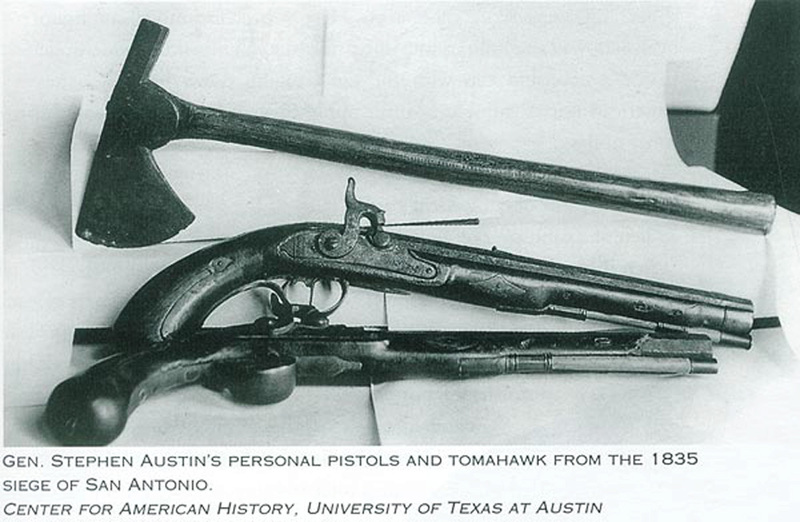 Polled 'tomahawks' were either designed or used as weapons. Polled axes/hatchets are really any tools that have a blade & a hammer poll-- those which may have been used as a hunter's belt axe might also fit in the tomahawk category and again that depends on who you ask. Belt axes and small tomahawks are terms used interchangably sometimes but not really accurately. Ordinary polled frontier hatchets used as tools are not usually decorated with filings, notches or other purely decorative features and overall patterns although some do. Just because it is a polled axe that was hand forged more than 150-250 years ago does not make it a tomahawk. 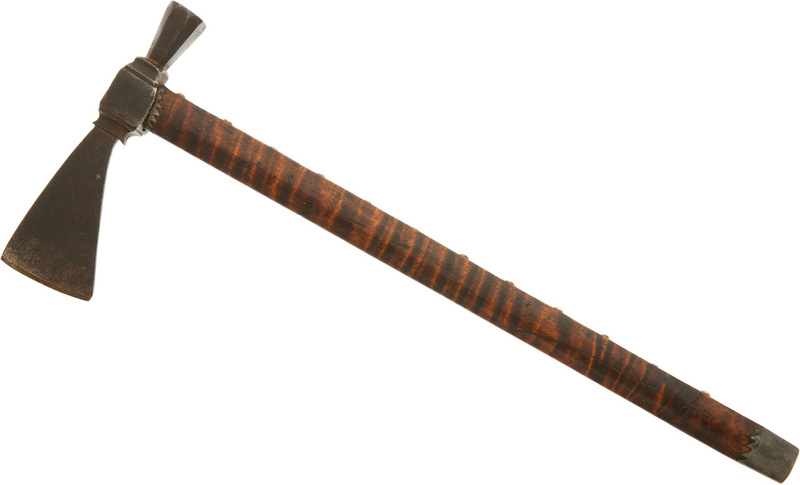 The term tomahawk is added when the axe was used as a weapon. 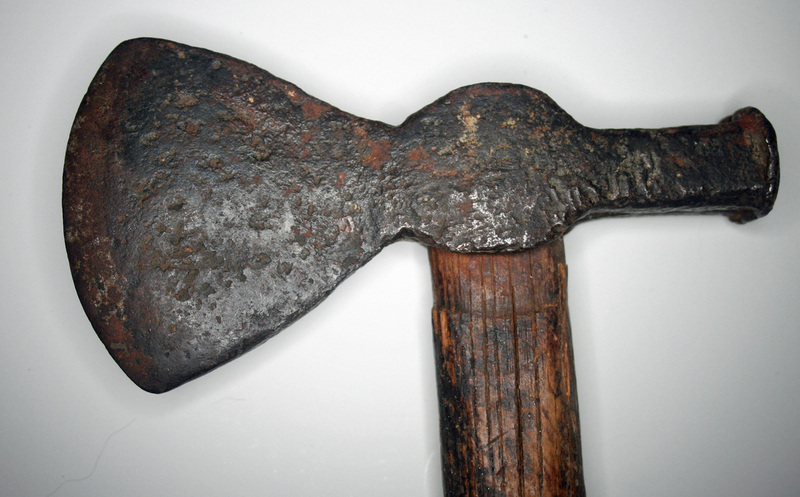 Polled axes/hatchets had far more uses than as a weapon & they don't sell for a hundred or two hundred bucks on ebay. Collectors can convince themselves that they all could have been used as a weapon but who are they really fooling? The following are not definitive but rather characteristics in support of a tomahawk ID based on proven examples. With so little absolutes it is rare to find one that fits perfectly. Remember that most polled hatchets were hammering nails, not people. They don't sell for 100 bucks on ebay, but the misidentified ones do. Like any category of tomahawk, identifying starts with studying those polled tomahawks which have a proven irrefutable provenance. Compare all others to that--nothing else. The 3 general criteria for determining whether a polled hatchet is a polled tomahawk needs to include at least one the following. Everything else must be considered a tool. Conjecture never proves anything. 1) Verifiable documentation of Indian/explorer/trader usage as a weapon. 3) The axe has authentic Indian decoration on a haft original to it. 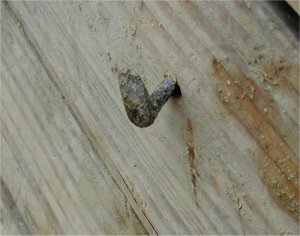 * The absence of nail pulling notches does not necessarily indicate a polled hatchet was used as a weapon. 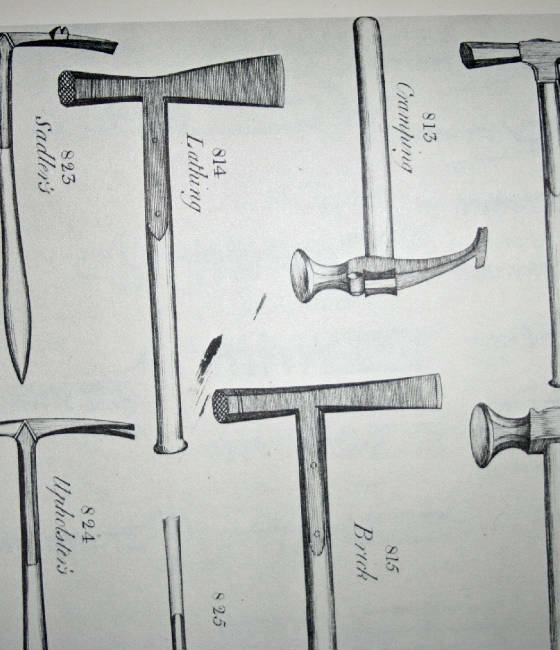 Many polled hatchets made & used as tools never had nail pulling notches as evidenced by old hatchet manufacturer catalogs. Since it can weaken the blade cheek it was not always preferred, particularly on iron hatchets with small steel blade inserts. Also there are some rare tomahawks where nail pulling notches were added after their use as a weapon had ended. Farmers that plowed up these heads might occasionally put them to use again as a tool and add a notch. (See page 5 -- top of page). Here is a very rare engraved with silver inlay Revolutionary War polled tomahawk which sold for $87,000+ from a 2006 Bonham Auction. It has been published in 5 or 6 books including Peterson's & Hartzler & Knowles. This polled tomahawk at the top of the next photo was found in 1924 by amateur archaeologists at Nicholas Deny's trading post (circa 1645) on Lameque Island, in the Acadian Islands region of Canada. 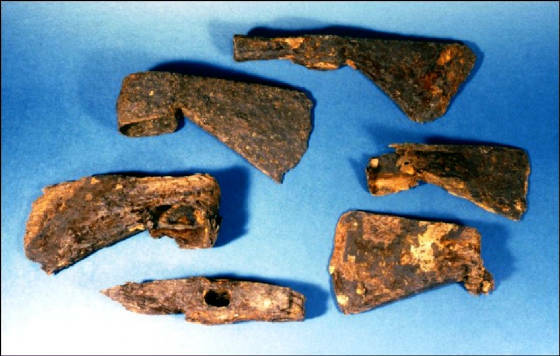 It was discovered with four other French biscaine trade axes. 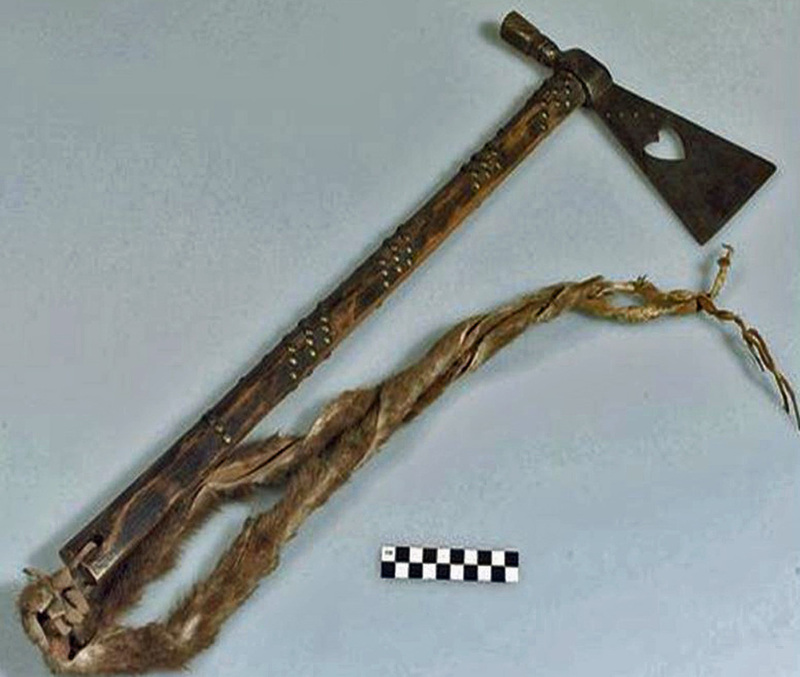 This example is probably the oldest polled tomahawk found to date. The size is not available to me but judging by its photo next to the other axes I would guess it to be 8.0-8.5" long with an octagonal shaped poll that expands/flares outward. Among antique hammers that same kind of flaring outward of the octagonal hammer poll occurs in the mid 1700's & on back to the Roman era. C.C. 'Cub' Gerow Collection--BRASS INLAID LETTERS, 5.75" long, collected in Lancaster, PA.
Dug polled tomahawk with brass half moon inlay excavated from Alabama. Photo courtesy Eve Ottmire. Hammer polled tomahawk with script letter G and I on head. Kentucky-Pennsylvania rifle gunsmiths preferred curly maple hafts for the tomahawks they made just as their guns. Often these were special orders for white men or Native American chiefs. KY rifle gunsmiths were highly skilled craftsmen and capable of highly elaborate detailed work with many inlays as found on their rifles. Curly maple hafts on tomahawks are a primary indicator of one of these specialized smiths. However curly maple was not so great for striking weapon hafts because the grain ran across it (where the curl goes) so they could break in half rather easily. I doubt these were used as weapons much because of that feature. 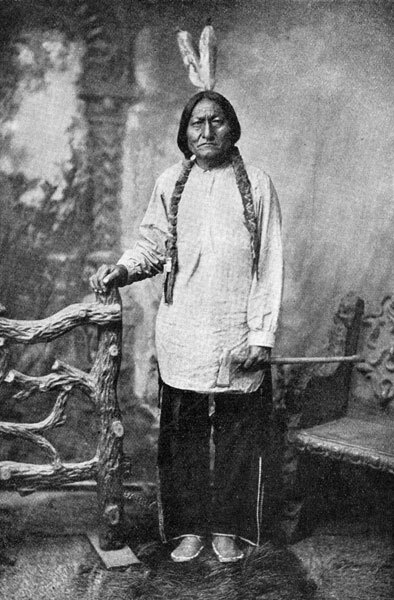 This is a picture of Sitting Bull's polled tomahawk with a utilitarian style head, atypical short poll and an longer than average haft for better reach from horseback. It is referred to as a tomahawk because it was known to have been used as such. This was a tool adapted as a weapon, sometimes known as a 'Cow Killer' Axe for stunning the animal in the forehead & general farm use. It has a manufacturers name but it is no longer legible along with the words "Steel Warranteed" which is a term commonly used on manufactured tools. Indians didn't care about whether the steel was warranted or not & steel wasn't even required for a weapon. Hard to return it anyway should it fail ;). This was what he surrendered in 1881 at Fort Randall. This may be the same one shown in an 1849 painting by Farny now in a Finland Museum. 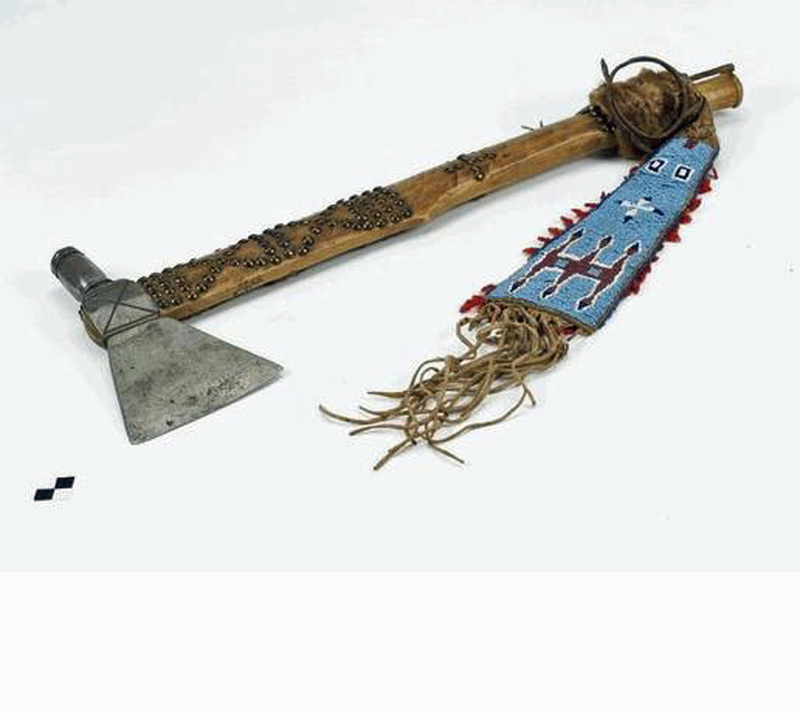 He also owned a pipe tomahawk with a heart cutout and a beaded drop which is now on display the West Point Museum, (see More Pipe Tomahawks page 14). Holding the above polled tomahawk presumably. This one has the bilaterally flared blade common on a number of known polled tomahawks. Crow from Montana. The hammer is generally octagonal with moldings at top and bottom. Additional moldings are filed above and below the eye, and two deep file lines form an X across the area. From the Smithsonian collection & shown in Peterson's book. Ojibwa polled tomahawk ca 1860s-80's. (Smithsonian collection). This 1835 silver hammer polled tomahawk (referred to as a "hatchet" by all accounts at the time) was presented to the Tennessee frontiersman David Crocket by the Young Men of Philadelphia and now resides in the Smithsonian. The end piece on the haft appears to be ivory. I doubt it saw any action & with it's soft silver head it likely was intended to be more admired than used as it was never brought to the Alamo with him in 1837. Oh and the only place he was called "Davy" was in the ever inventive press, books and movies which created all sorts of other tall tales including that name. He really went by the name David. Some have mistakenly called this style 'Spanish' but this one was most assuredly made in Philadelphia. More accurately it should perhaps be called Spanish pattern at best. Here is a U.S. marked polled tomahawk excavated from a Greenville, OH. site in the 1940's, probably from the 1794 Battle of Fallen Timbers at Fort Greenville. The blacksmith's mark is unfortunately illegible. There is a similar one in Peterson's 'American Indian Tomahawks' No 302 & in his 'The Book Of The Continental Soldier'. 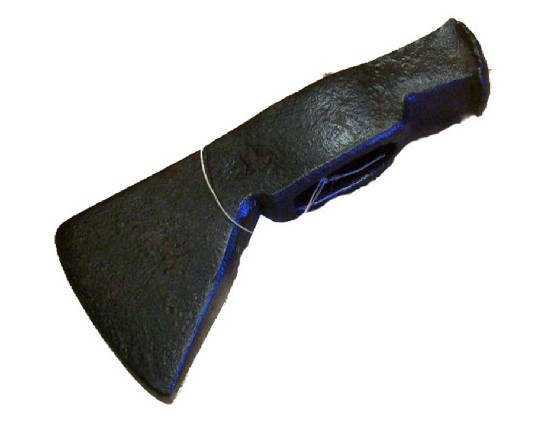 Many of the references to U.S military hatchets being issued or required to be provided simply term them hatchets or tomahawks but they are usually referring to any small hatchet--including the simple trade axe. Below here is a similar one to the above however without markings & a fluted decoration at the base of the poll & a spur embellishment near the eye. 5.25" long. Polled AXES or HATCHETS from the same frontier period were designed as tools & tend to get categorized as polled tomahawks. Not everyone had access to a hardware store so the village blacksmith made many things asked of him including hammer hatchets. Some collectors will buy virtually ANY polled hatchet & desperately claim it could have been a tomahawk--collector bias at its worst. The term tomahawk is often applied by sellers in order to beef up it's selling price, though it rarely is true. I'm not sure I can clear it up enough to satisfy all, other than showing more examples of each. While they are variable in style they are not undefinable. Authors & collectors show examples of polled hatchets and polled tomahawks, yet never define them. Polled hatchets such as those below were actually designed as tools. Whether they were used as belt axes or as weapons is impossible to say without provenance. Polled tomahawks were something different and were originally designed as weapons. Early style polled hatchets were used by frontiersmen, explorers, hunters, carpenters, plasterers, dry goods dealers, and farmers to name just a few. Course the farmers & carpenters usage doesn't sound nearly as glorious. Their past use is unfortunately indistinguishable unless the haft has some decorative characteristics such as legitimate brass tacks, etc. 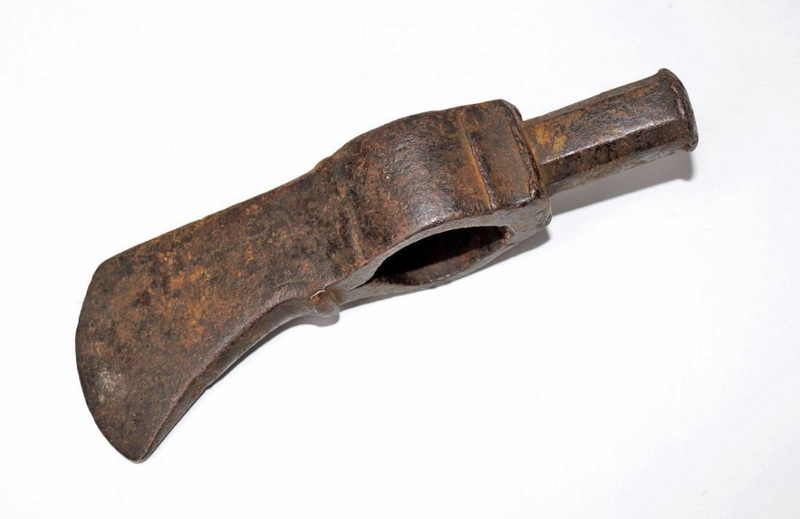 Early polled hatchets (tools) of the 'Spanish' pattern with two halves of iron sandwiched together on either side of the eye. 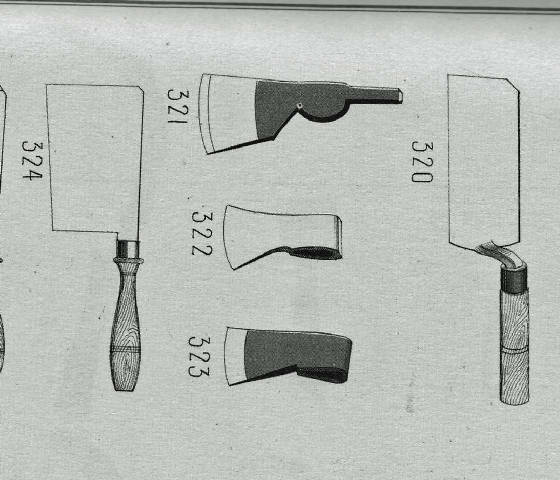 This term Spanish pattern also is a bit of a misnomer since this type of sandwich construction has also been found on occasion among British, French & American made hatchets as well. I have another one marked by the blacksmith "DODGE"--certainly not a Spanish name. This head weighs 1 lb. 5 oz., measures 7.5" x 3.25" and was found in 1908 near or on the site for Fort Quiatenon, Indiana Circa 1740's-1780's. French inhabitants from the Voyageurs who traveled there intermarried in this site with natives. That of course does not make it a tomahawk or weapon but just the mere suggestion of it has people jumping to that conclusion. This next one weighs 12 oz. total and measures 5.125" x 2.5" wide, circa mid to late 18th C. Charles Hanson in MFTQ, Vol 15, No. 1 identifies these an '18th C. iron hunter's tomahawk' which had better balance & workmanship than the 'squaw axe' [common trade axe] which was better adapted for both chopping & throwing. Unfortunately Mr. Hanson never gave any sources or reasons as to why he identified them as such. I've never heard of the term "hunters tomahawk" from any other source before or since. Hartzler and Knowles identify the same exact style as belt axes but mention no criteria for doing so either. The terminology is loose and fancy free in these categories and will change with each writer that addresses them. Whether they were used as weapons or not is usually in the eyes of the beholder and no more so in this category does Confirmation Bias affect that decision. There is a tendency for some collectors to see only what they want to see--all the more reason to rely on verifiable physical evidence based on proven examples & physical features rather than indiscriminate feelings. To my knowledge none have ever been proven or shown evidence of having been used as weapons although I would never say it would be impossible. Years ago I remember looking at a table at a show with an unusual item people were trying to guess what it was. One guy who collected colonial items thought sure it was a colonial homestead piece of some kind. Another guy who collected early Indian items thought it was definitely an early Indian related item. They debated about it for awhile back and forth with seemingly convincing arguments while a crowd began to gather. Then the seller arrived with a big smile on his face saying it was neither. He had made it last summer at a Rendezvous reenactment to carry his display cases in. ;) Well, what can you say. Afterwards the seller was asking everyone who went by what it was, hoping for another laugh. Sometimes it ends up being whatever people need it to be. This one looks a little like the Sitting Bull tomahawk but it is marked B&O railroad & larger in size. Carpenters tools were brought over from the new world from Europe by immigrants. Among them were polled hatchets. Some assume every tool brought over was a potential tomahawk and the naïve are eager to buy it. These first 2 examples are of a 19th C. or earlier Spanish made one that are still currently in Spain. The 3rd example is from France and still currently in France. They hammered nails with these. A polled hatchet meant that you didn't need to carry a hammer AND a hatchet. Variations of these were extremely common in nearly every country. Some of these various types have been imported to the U.S. recently to be resold as tomahawks et al. DOES THIS LOOK LIKE A HAMMER POLLED TOMAHAWK? ITS ACTUALLY A BULGARIAN HAMMER POLLED HATCHET--STILL IN BULGARIA. This reproduction was wax cast from an original & they have been making these for at least the last few decades. Last month I saw one of these sell at live auctioneers as an original for ~$1700. It even had remnants of the black paint. When trying to discern whether a tomahawk is a casting of an original or an original look closely at the pitting. If it looks smooth & molded in the pits rather than sharper & more defined then it is likely a copy made using the lost wax method of casting (no seam) or similar method. This is another one made by knife maker Daniel Winkler as props for the 1992 movie Last Of The Mohicans"
Most early hand forged polled hatchets that are individually made & not confined to a particular pattern but rather more individualized to the users requirements or the blacksmith's tastes. They won't be found in old tool catalogs, particularly in foreign countries. People who are not tool collectors assume we have ALL the tool types accounted for in all the catalogs & anything else must be a tomahawk. Far from true. We have many but not even close to all. Of those few catalogs that have survived far fewer have been reprinted for the average collector to have access to. Those hand forged by individual blacksmiths would have never been in tool catalogs since they were one of a kind & designed to the user's specifications. Is it at all possible they have been used as weapons? Sure but what evidence do you have that it was when most were not? useful tools at any of the early frontier homesteads and were hand forged. Considering how many different countries made forged polled hatchets which sometimes changed slightly with time that makes for an awful lot of shapes that applied to an awful lot of uses other than a weapon. The next is from an old Elwell catalog 1867-1875 (British) which shows a polled axe No. 321 as a "Mauritius Shingling Hatchet" sold in different sizes. Also interesting is #323 which looks like our trade axes do. I'm not going to list all the varieties of polled hatchets from all the countries & companies & individuals all over the world throughout history which had nothing to do with the our N. American frontier history, but suffice it to say there could be a book written on that subject alone. Just because it is a forged polled hatchet does not make it a tomahawk/weapon. And just because it is in this country today does not mean it was always in this country. And how about the ones that hammered tacks or harness rivets? As much as I hate to say it there is a whole world out there besides tomahawks but when that is what you are desperate for it is easy to ignore that. Spanish hammer polled axe--NOT a tomahawk and still in Spain. There are many thousands, if not millions, of old hammer polled axes from around the world that are NOT tomahawks. Very few are. This axe looks like a hammer polled tomahawk at first glance but look at the top view where the blade is canted to the side for hewing slices of wood. It is a French hewing hatchet with a long narrow hammer poll found in the tool chest recovered from the sunken ship LaBelle in 1685 from LaSalle's exploration along Texas. There were none of these in the hold to be traded to Indians just the one in the ship's tool chest.